If you’ve every struggled to find your way around the internet, you’re not alone! That’s why I wanted to record an updated video tour of Ministry-To-Children. I’ve included some of the advanced functions that might help you get more from our free content. I hope this is helpful – please leave a comment below with your feedback. I’d love to hear what is most frustrating about our website and any suggestions to keep making it more useful. Tony, Thanks for the video tips ! 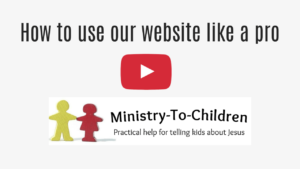 Appreciate your website and your ministry. Tony Kummer (Editor) reviewed & updated this page on : November 8, 2018 at 3:43 pm. All our content is peer reviewed by our readers, simply leave a comment on any post suggest an update.